I walked up the stairs slowly but steadily, feeling waves of excitement and trepidation wash over me as I reached my classroom. What would the day be like? Who was my teacher? Who were my classmates? Would I even like what I was going to be doing as much as I had thought I would? My classroom was no ordinary classroom, and my school was no ordinary school. The Center For Kosher Culinary Arts was founded in 2008 by Jesse Blonder, a Cornell graduate and former kitchen manager for The New School’s culinary program, and Rabbi Baruch and Elka Pinson, who owned the store space below where the school was to be located. Together, the three had a vision to expand the culinary horizons of the kosher world. When you attend a cooking school (the only kosher cooking school in New York, in fact), your classroom can’t be an ordinary room, with just a blackboard, desks, and chairs. We did have a blackboard (or rather, a whiteboard), and we did have chairs, but instead of ordinary desks, our chairs were situated around large stainless steel islands that also served as our workstations. The other half of the room was taken up by an over-sized professional grade oven with several burners, and the pantry area where all of the ingredients that we needed were kept. When you’ve grown up around the kitchen like I have, being in a kitchen environment is instantly comforting but I didn't have much time to sit back and enjoy since we hit the ground running from day one. Our chef instructor was a well-seasoned professional who was passionate about his art and ever patient and compassionate towards the students. Chef Avram Wiseman (now dean of students) had a long and distinguished career before joining the teaching staff at the school, from being Executive Sous Chef of the United Nations kitchen, to teaching at the Art Institute of New York. Under his expert guidance, we learned all the basics of French cooking: the knife skills, the mother sauces, the cooking techniques, how to present your dishes. We even had a class where we applied our knowledge towards cooking for Shabbos. And, along with the cooking itself, we were taught all about the importance of food safety in the kitchen and had Rabbis from a kashrus organization come and give us lectures about the role of the mashgiach in the kitchen. The students themselves were my peers – regular, every day people who wanted to better themselves in the kitchen, though there were a few who wanted to better themselves professionally as well. Between the students and the chef, my time in “school” felt more like a group of friends just hanging out in the kitchen and having a good time. Class time came to an end all too soon, but my time in the culinary world did not end. One of my favorite parts of class was when the chef showed us various plating techniques. Have you ever browsed through the pages of a magazine and drooled over the luscious looking pictures of food? That is thanks to the work of both the food stylist and the food photographer. The stylist cooks the food and prepares it in such a way that it looks like a five star chef had cooked the dish, while the photographer puts the finishing touches using a photo-editing program. During my time with the stylist, I gained that much more of an appreciation for the amount of effort it takes to put together a magazine. Each photo shoot involves several takes, with the photographer and the stylist figuring out the best type of lighting, and the best way to arrange the dish and make it look its best. Soon enough, my internship came to an end. But just when I thought my time in the culinary world was ending, I found that my school was also instituting a pastry arts class. You can bet I signed up for that. As I walked up the stairs to my classroom, I felt nothing but a sense of excitement. And maybe a little bit of déjà vu. I had been here before, after all. But, instead of that nervous student, I was simply excited. Because even more than cooking, baking was my thing. For every family get-together and for every yom tov, I was always asked to bring the dessert. Here was an opportunity to perfect my craft and branch out my repertoire of desserts. And branch out I did. We learned all kinds of desserts, from the super simple to the more complex. We learned how to make muffins and cakes that you would normally just get out of a mix. We learned how to make meringues and the dough called “pate a choux” (literally, shoe paste) from which you can make éclairs and cream puffs, and even the Mexican dessert known as churros. Towards the end of class, we learned how to decorate those sheet cakes. Class was seasonal as well. The chef, just as professional and knowledgeable as the culinary arts instructor, also structured classes based on what yom tov it was near. We made donuts for Chanukah (glazed with chocolate and vanilla frosting and topped with sprinkles), macaroons and other Pesach friendly desserts for Pesach, and cheesecakes for Shavuot. And while my instructor is no longer with the school, the pastry arts program is now under the care of chef Phillipe Kaemmerle who has just as distinguished a career as chef Wiseman, from a two Michelin star kitchen in France (among others) to gourmet restaurants in New York, and a teaching career that began at the Art Institute of New York. Once again, school was drawing to a close, and left me wanting more. So when school finished, I decided to extend the life of my stay in the culinary world with another internship. If I had spread my wings and branched out before, I was really going to do so now. The bakery that I had been paired with was a small, one-woman operation whose passion was making her wares not only tasty, but good for you. And not only was it good for you, all of her baked goods were completely dairy free, nut free, and allergen free. And I was back to being a nervous, apprehensive student. Sure, I do my best to eat healthy, but this was health food. And would most likely taste like it. Could I bring myself to lie to my employer and tell her how amazing her stuff was when I tried it and disliked it? But, if ever there was a case of not judging a book by its cover, this was it. Who knew that cookies and cupcakes and muffins (and even one gigantic cookie cake made upon request), that were good for you and made with strange and sometimes exotic ingredients, could actually taste good as well? Sometimes, breaking outside of your little box could lead to good things. Breaking outside my box also taught me that limits that I had placed on myself and my abilities were artificial. I learned key math skills – how to double, triple and quadruple a recipe. And on the flip side, how to halve one. I learned social skills – how to work well with others when you all need the same counter space and there’s no other room to spread out. And I learned how to work both quickly and accurately to produce the amount that was necessary for the day while still keeping to the high standards that our employer held to at her bakery. Ignoring your box can lead to new and amazing experiences that you might otherwise have never had. So this time instead of being sad that my time in the culinary world was coming to an end, I was just grateful that I had the opportunity to work with different people and expand my knowledge of food. Should I ever feel the need to spread out more, the Center for Kosher Culinary Arts will always be there for support. In the future, they plan on instituting an associates degree program for anyone interested in earning a hospitality degree. And along with that associate’s degree, their lifelong dream is to have the school become more than just a school – but to become a “culinary incubator” of sorts, where small businesses can be nurtured in their infancy and grown to their full potential. Traveling is always a pleasure, but keeping kosher on the road can be a challenge. Whether you’re looking forward to a long vacation or to a short getaway, planning ahead will make your trip easier. Kosher travelers often find that the amenities they’re accustomed to at home are hard to find everywhere. Finding kosher food is just the beginning; finding a minyan or a mikvah can be even more difficult. Shabbos accommodations, too, are vital considerations. In the Kosher Travel Guide you will find fully updated and expanded information for the cities listed below, including information about many new locations which we've never visited before. The total now is 267 cities, up from 236 in 2012; 95 pages packed with information. This is the largest detailed kosher guide to U.S. cities available anywhere. 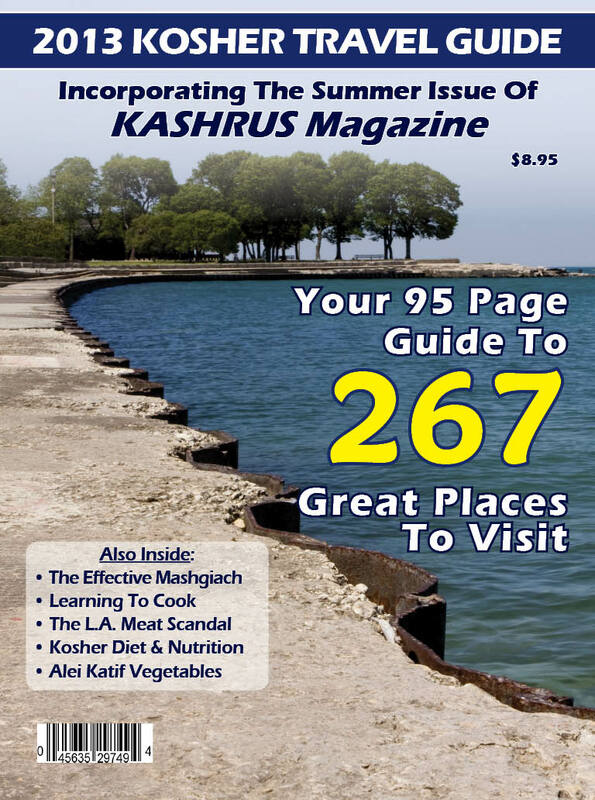 This year's Kosher Travel Guide includes: Albany, Allentown, Amberley, Ardmore, Atlanta, Austin, Aventura, Bala Cynwyd, Bal Harbour, Baltimore, Bangor, Bar Harbor, Beachwood, Beaver Hills, Belmont Shore, Bensalem, Bethlehem, Bloomfield, Blue Ash, Boca Raton, Boro Park, Boston, Boulder, Boynton Beach, Bridgeport, Brighton, Brookline, Brooklyn, Brookside, Buffalo, Camden, Cape Cod, Carlsbad, Cary, Catskills, Center City, Chapel Hill, Charleston, Charlotte, Cherry Creek, Cherry Hill, Chesterfield, Chicago, Chomedey, Cincinnati, Cleveland, Cleveland Heights, Cold Spring Harbor, Columbus, Commack, Coral Springs, Cote St. Luc, Dallas, Danbury, Deal, Dearborn, Deerfield Beach, Denver, Detroit, De Vimy, Devon, Dollard-Des-Ormeaux, Duluth, Dunwoody, Durham, East Brunswick, Easton, OH, Easton, PA, Edgewood, Edison, Elberon, Elizabeth, Elkins Park, Englishtown, Fairfield, Fairlawn, Fallsburg, Farmington Hill, Flatbush, Fort Worth, Framingham, Freehold, Ghent, Glastonbury, Glendale, Golf Manor, Greenwood Village, Guilford, Halifax, Hampstead, Harrisburg, Hartford, Hicksville, Highland Park, Hilton Head Island, Hollywood, Hummelstown, Hunter, Huntington, Hyannis, Jackson, Jacksonville, Jersey City, Kansas City, KS, Kansas City, MO, Kendall, Kiamesha, La Costa, La Jolla, Lake George, Lake Sebago, Lakewood, Lancaster County, Las Vegas, Lauderdale, Leawood, Liberty, Linden, Livingston, Long Beach, Long Branch, Los Angeles, Louisville, Maitland, Manalapan, Marietta, Melville, Memphis, Mequon, Mercer Island, Merion Station, Metairie, Miami, Miami Beach, Milford, Milwaukee, Minneapolis, Monroeville, Montgomery, Monticello, Montreal, Mountaindale, Mt. Pleasant, Mystic, Narbeth, Natick, New Brunswick, New Haven, New Hyde Park, Newington, New London, New Orleans, Newport, KY, Newport, RI, Niagara Falls, Norfolk, North Hollywood, North Miami Beach, Norwalk, Oak Park, Old Orchard Beach, Onset, Orange, Orlando, Outremont, Overland Park, Owings Mills, Paramus, Park Heights, Pawtucket, Philadelphia, Pittsburgh, Pittsford, Plainview, Plano, Portland, ME, Portland, OR, Potomac, Providence, Raleigh, Rancho Bernardo, Reading, Richardson, Richmond, Ridgefield, Rochester, MN, Rochester, NY, Rockleigh, Roselawn, Salt Lake City, San Diego, Sandy Springs, San Francisco, San Jose, Santa Monica, Saratoga, Savannah, Schenectady, Scranton, Seattle, Seward Park, Sharon, Silver Spring, Simsbury, Skokie, Snowdown, South Beach, South Bend, South Euclid, South Fallsburg, Southfield, South Windsor, Springfield /, Longmeadow, MA, Springfield, NJ, Stamford, St. Louis, St. Louis Park, St. Paul, Summerlin, Sunny Isles, Surfside, Swan Lake, Tampa, Tannersville, Tarzana, Teaneck, Tidewater, Toco Hills, Toronto, Troy, Tulane, University City, University Heights, Vancouver, Venice, View Ridge, Ville St-Laurent, Virginia Beach, Warwick, Washington, DC, Waterbury, Watson Island, W. Bloomfield, West Ashley, West Hartford, West Haven, West Hills, Westmount, West Orange, Westport, Westville, Wheaton, Whistler, White Oak, Wickliffe, Williamsville, Windsor, Winton Woods, Woodbourne, Woodbridge, Woodmont, Woodridge, Worcester, Wynnewood, Wynnfield, Yardley. For the rest of the Kosher Travel Guide, click "Buy this issue now" or "Subscribe" at the bottom of this page.